We Can Help You With Everything From Flat Roof Repair To Installation. On top of all their other responsibilities, commercial building owners must keep attention on the repair of their flat or low-slope roofs. If you have ever had responsibility for a flat roof, you have probably encountered usual problems such as pooling water and mold. Great advantages for flat roofs happen with periodic inspections. A qualified check-up can locate any possible problems for a flat roof, and becomes majorly necessary if a lot of time has passed since the previous. 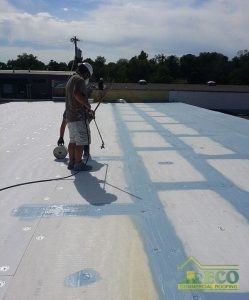 If you own a commercial structure and need flat roof repair in Texas, Louisiana, and Mississippi, ECO Commercial Roofing are the local leaders. If we detect a requirement for maintenance, we will provide an equitable estimate and complete the job in a timely fashion. Speed is of the essence when one considers flat roofing system repairs, as they will deteriorate and become more pricey. You can depend on prompt, excellent maintenance from our exceptional team of workers, whatever the issue. Does Your Flat Roof Require Repair? You should understand the essentials about the kind of flat roofing system you own in order to assign the finest care for a commercial structure. It’s additionally useful to understand other flat roofing systems, so as to render an intelligent decision when time comes for replacement. Each variety of flat roofing material, from PVC to foam, possesses its own advantages and disadvantages. Regardless of the kind you choose or possess, our expert roofers understand how to perform service or installation to gain the most benefits. For instance, typical problems like ponding water or moisture accumulation can become avoided through quality installation from our team. If you need flat roofing repair work that you may rely on, contact ECO Commercial Roofing right away at (833) 200-0571. If you need a contractor that has a significant amount of experience and expertise completing a variety of roof solutions for a variety of budgets, you can count on us. In order to fulfill the requirements of our customers, we can help you with repairs and replacements of your flat roof, along with maintenance services to defend your roof from damages. Our business has been serving our community for years by providing flat roof repair Texas, Louisiana, and Mississippi, you can trust! When you require assistance with your commercial flat roof, contact (833) 200-0571 for the roofing professionals you can rely on to do the job correctly, and at a reasonable price, ECO Commercial Roofing!